It's probably boring to keep writing apologies for how long its been since the last eZine but hey, we've been BUSY with lots of GOOD stuff! We've hosted the Magic Marker Mastermind retreat, co-hosted The THEO Accelerator retreat, lead a 3 Day Fundamentals of Interactive-Visuals workshop, converted one condo fully into an office (and another into my home), launched the Biz Basics for Process Professionals class AND got Stasi Manser up and functioning as our new Office Manager. Whew!!! We are all ready for a few well-earned margaritas! Before we take some vaca time, we are finalizing the fall and winter curriculum of SHIFT-IT School. So stayed tuned for more info on an expanded Magic Marker Mastermind (enhanced to 9 months with 3 retreats) plus a new "Inner Work Course" on the inside, energetic approach to manifesting your thriving creative-based lifestyle. Only offered twice a year! 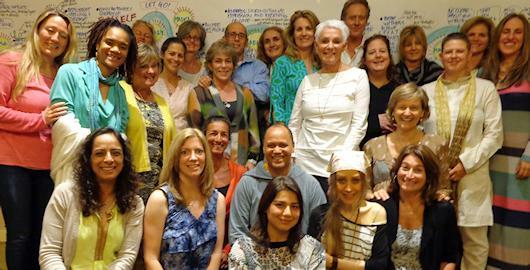 Our signature coaching group - gives you a powerful foundation to Become Your Next Self. Gets you what you next want in your personal and/or professional life. You develop a crystal clear vision, unravel your resistance ... and rapidly shift your world to a much more satisfying state. Practical real-world strategic planning coupled with leading-edge Law of Attraction wisdom --- all in our innovative 'Visual Coaching' style. 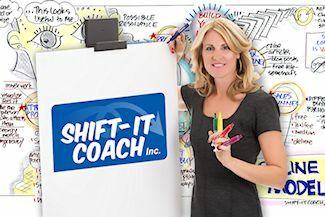 Join this supportive community with other like-minded SHIFTers from across the globe, includes The SHIFT-IT Home Retreat Kit® with 17 visual maps. Over 87% of your facilitation, coaching, training and consulting clients are visual thinkers - learn powerful visual skills to boost the effectiveness of how you work with them. This online, professional skills training thoroughly covers custom chart work, visual scribing, visual facilitation and visual coaching (the four main applications of working visually with groups and individuals) so you can add these powerful tools to your own process toolkit. This is the online version of my popular 3-day fundamentals training (no travel required). 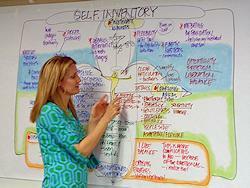 Keen to integrate the visual way of working into your consulting, facilitation, training or content rich business? 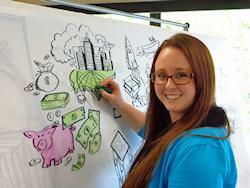 On the fast track to becoming a Visual Facilitator, Coach or Scribe? 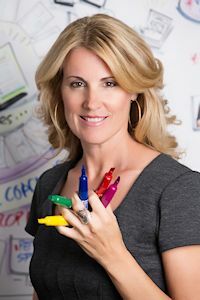 Christina Merkley has limited availability in 2013 for private business coaching and visual skills apprenticeships customized for your unique needs. Get the power of a highly skilled and supportive visual pioneer working one-to-one on your success! A few weeks ago I hosted our annual in-person Fundamentals of Interactive-Visuals workshop (beginning course that preps you on the four main ways of working visually). 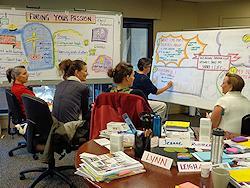 I also just completed the core training for this season's cohort of Certified Visual Coaches. In both these experiences, I answered questions on the merits of in-person work vs working virtually (electronically) with clients. So the topic of today's eZine is front and center in my mind. I've been working interactively with visuals and various kinds of process work for going on two decades now. My history in the work (thanks to my mentor David Sibbet of The Grove Consultants) is in the large-scale medium. 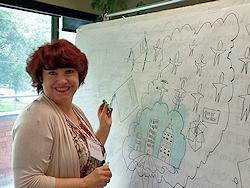 Using very large sheets of paper (mural size) in front of a group, to literally draw their best thinking out of them. The power of working in-person visually (using the large approach) is what I think of as the "mouth-to-eyeball-to-brain-to-heart" effect. People's words are literally drawn out in front of them ... they 'see what they mean' to use a helpful turn of phrase from David. And they connect with that meaning in powerful rational and emotional ways; ways that often they weren't able to do until it was literally drawn out for them in the moment. Once thoughts and feelings are properly understood, then good solid decisions for planning and moving forward can be accomplished. All based off of the terrain that the visuals made apparent. If you have ever been in the room when live recording, facilitation or coaching is being done well with visuals ... well, you know the power and magic of it. There is just something about a human being using markers to draw in the moment, using the exact words of what is spontaneously being spoken and putting images to them. Something that is visceral, core and very, very human and humane. A wonderful juxtaposition to the Powerpoint dominant manner that most meetings are run in. While working virtually and electronically has its merits, nothing fully replaces that core magic of working live in a room using markers and a big visible surface ... nothing. While nothing replaces the power of working in-person with large sheets of paper (or on whiteboards, foam core and such) ... there are many other mediums that have their useful place in the 'working visually toolkit'. And working virtually via various electronic or digital means definitely has its uses. It's not the same as working in person, but there are some circumstances where its really handy and perhaps the next best option. I first experimented with working virtually in my coaching practice. For years my practice was naturally limited to those who either lived near me or were willing to travel to me ---- as I worked solely in the large, in-person format. 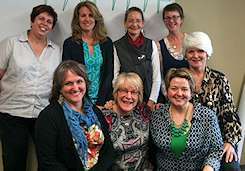 However, there came a time in my practice when I moved (from San Francisco back home to Victoria, British Columbia) and some of my previous clients wanted to continue to work with me (but weren't willing to jump on a plane in order to do so). So I tried something new with them ... I worked first by phone (then by video conference) and shared small size visual templates with instructions (what is now my signature SHIFT-IT System®). They completed their maps on their own and sent the results back to me before our next session. Or, alternatively, I facilitated a map for them during our session, then emailed the visual artifact to them afterwards. While it did not fully replicate the in-person experience, I found that it did do the trick in a different way (a way that did not require expensive or time consuming travel). And, over the years, thanks to improvements in technology (and in my tech skills) the 'interactive' effect between my client and the visuals produced with and for them has greatly improved (with more improvement still to be had). Nowadays the virtual/electronic way of working is taking hold in visual work with groups as well as with individuals in much more sophisticated ways than my humble explorations. While its tricky and still cumbersome to do electronic visual recording, facilitation and coaching work --- it is possible, and is something that consumers are asking for in increasing volumes. We now offer online versions of most of our in-person classes. It's not the same as the in-person version but the online is a good alternative for those who can't travel but want access to our information. And, while I won't be offering virtual scribing and visual facilitation services any time soon (I prefer my paper and markers for that) I am expanding into virtual Visual Coaching ---- using online collaboration technology to work visually with my SHIFT-IT coaching clients and Certified Visual Coach mentees from across the English speaking world. While the virtual way of working visually is still cumbersome, it won't always be so. It's amazing the advancement of technology that has occurred It Will Get Easier and Better:in the last few years ... and I'm sure a big breakthrough will happen soon that will bust the virtual way of working wide open for us visual practitioners. There will always be a role for the intimate nuances that working in-person can only bring --- however it is exciting about the advancements that are happening tech-wise that enable us to work in alternative yet still effective ways. All the best with your virtual explorations!